What is atrial fibrillation (or Afib as it’s often called)? And who gets it? AFib is a type of irregular heartbeat. It occurs when one or both of the upper chambers of the heart—called the atria—beat erratically. This puts them out of sync with the heart’s two lower chambers—called the ventricles. Afib affects more than two million people in the United States. The odds of developing afib go up with age. 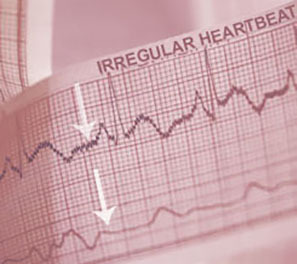 In fact, according to research, afib is the most common serious type of irregular heartbeat in people over the age 65. It’s also sometimes associated with other health problems, such as heart disease, diabetes, or high blood pressure. * Do you have palpitations (racing, fluttering, pounding, or flopping)? * Do you have chest pain, pressure, or discomfort ? * Do you have abdominal pain? * Do you have shortness of breath? * Do you have lightheadedness? * Do you suffer from fatigue or lack of energy? * Do you suffer from exercise intolerance? * Do you find yourself getting confused often? Atrial Fibrillation Fact Sheet. August 13, 2015. Centers for Disease Control.